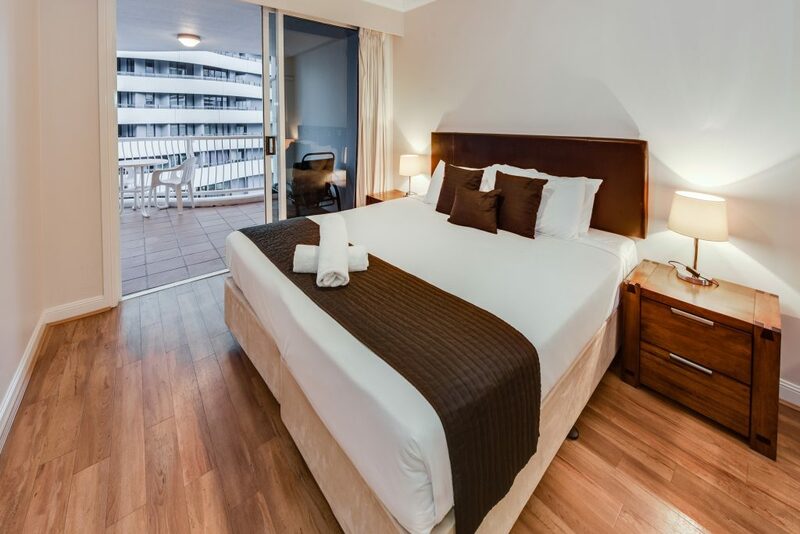 I was recently asked for a recommendation on 2 bedroom apartments in Broadbeach. The person asking me said, they’re all pretty much the same, aren’t they? The answer is very definitely ‘no’! In theory, yes, you’d think all Broadbeach holiday accommodation would be pretty similar. But resorts do differ substantially when it comes to things like quality, space and inclusions. For example, you might find a 2 bedroom apartment with just one bathroom, or with a kitchenette rather than a full kitchen. My point is, it pays to do your homework. My recommendation to this friend was the Phoenician Resort in Broadbeach. Yes, it’s a 4-Star resort but that wasn’t just the reason. I love the fact that the 2 bedroom apartments here actually offer 2 separate bedrooms. Now that might sound obvious but it isn’t always the case. Ask any parents looking for 2 bedroom apartments in Broadbeach if they’d like to be able to close their bedroom door, and the door to the kids’ room, to hide away the mess, and it would be a resounding ‘yes’! I like the fact that the master bedroom comes with an ensuite, whilst the kids are catered for with a second separate bathroom. Another big tick! Then there’s the living area. Two bedroom apartments at the Phoenician Resort include separate living areas, so everyone can get some space and separation. Another big tick for that, and for the fully-equipped kitchen. No kitchenette here, rather a gourmet’s delight featuring top quality European appliances. Again, those travelling with children know how important a kitchen can be. The other great advantage of a resort apartment is the resort facilities. Despite the proximity to the beach it’s still a must in my book to have those essentials like swimming pools, spa, sauna and gym at the resort. The games room for the kids is a handy addition, too. So next time you’re looking for 2 bedroom apartments in Broadbeach remember, not all Broadbeach holiday accommodation is the same.